If you're in London or not too far away,The Golden Hinde in Southwark is one of London's many things to do and is part of a perfect trip out for any pirate/history fans. Eliot has always enjoyed being out and about across the capital and loves the varied sights of what the capital has to offer. Lately, he has been particularly fond of London’s historic sights and revels on the background stories and facts behind them. One of his favourite historic subjects at present is pirates and ships. So when we mentioned paying the Golden Hinde a visit he was very keen! Especially when his dad told him stories and facts about of one of history’s most famous Elizabethan sea captains, Sir Francis Drake and the mighty ship, he couldn't wait to get there! Situated on the historic banks of Southwark, moments from London Bridge Station, and under the shadows of the gothic majestic Southwark Cathedral, The Golden Hinde is an exact replica of the real thing and is moored perfectly to where many boats and ships of the time would have docked. Below deck is very tight and apart from Eliot, the rest of us had to duck down as we explored the lower decks. It really gives you a feel for how difficult and awful it would have been for the crewman who manned the guns as explosions and chaos rumbled around the ship. The living and sleeping quarters were extremely cramped which makes you wonder how the crew coped. Being a grumpy, bossy captain! We enjoyed our trip to the Golden Hinde and learning about the different parts of the ship and what they would have been used for. The Golden Hinde is open daily but do check the website as they close for private functions, you can also see what's on as they have special events on certain days. The day we visited there was a pirate training activity! Have you visited the Golden Hinde? Nola's 6, 7, 8 & 9 Month Update! Nola you are now nine months old, the same amount of time you were growing inside me. I'm sorry I haven't kept up to date with your updates, there wasn't any big changes between five and six months so I thought I'd pick things up again at seven months, then eight months and before I knew it here we are at nine months old! You have grown a lot, especially your hair it's getting thicker and thicker! You have become more smiley, you 'talk' a lot making an 'aahhh' sound and you have continued to work hard at holding objects and rolling over. You have been rolling all the time these past couple of weeks and you're getting pretty good at it, you did bump your head at the weekend and bruised your head. Seizure wise they made a come back unfortunately. When you were six months old I noticed when you were sleeping sometimes you eyes would open and then flicker, I was pretty sure they were seizures. So I sent a video over to the epilepsy nurse, I didn't hear back but then received a letter for an appointment at Addenbrookes with the paediatric neurologist, it turned out the epilepsy nurse had forwarded the video to him. He put you on a third medication and told us he would see you again in July. The next day you began to have infantile spasms again so called I the neuros secretary and explained. The Dr called me that evening and said we'd stick with the plan, which was introducing the third medicine over four weeks and that should hopefully stop the spasms. It didn't so our appointment was brought forward and we saw him again a couple of weeks ago and he said the next stop was to put you on steroids. I really didn't want to put you on these as the side effects aren't great. But the with the overall outcome of infantile spasms there really is was no other choice. You have been an absolute trooper on them though Nola, you've just been amazing so so good! Very quiet and dazed at times but you have been smiley at times too. The good news is they stopped the spasms quickly and they have kept away so far! We started to wean you yesterday on your nine month birthday so I'm hoping that will be ok as I know it can be difficult for some little ones. I don't think your development has gone back, if it has only a little. You wanted to roll for ages and you're doing it consistently now! You also want to sit up by yourself, you're getting there. I know you'll do it, I'm so proud of you! You're still not overly keen to use you hands, although you'll bash things and try to grab them if you're in the mood. A few weekends ago you mastered blowing raspberries and couldn't stop doing it! You haven't done it as much since you started the steroids. You cut your first tooth just after you turned six months and the second one followed shortly after! In April you had your first trip abroad to Disneyland Paris, you were far better behaved than your big brother! It was such a nice getaway, not in anyway relaxing but wonderful to getaway...Disney is magical! 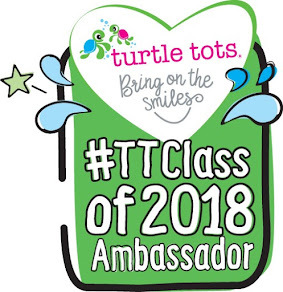 We were chosen to be ambassadors for Turtle Tots which is very exciting! We started our swimming lessons in May but have stopped for now due to your immune system being suppressed whilst on steroids. You love being in the water and did lots of splashing around. I moved you up to size 4 nappies at some point but discovered today you still fit in a size 3! Wearing purple for world epilepsy awareness day! Nothing has changed about your appetite! You still love milk and of course I started weaning you at six months. I gave you different vegetables first, broccoli, potato, carrot, cauliflower, parsnip, peas, green beans. You liked most of them but broccoli made you heave he first time, you were fine after that though. You definitely prefer sweet though as you can't get enough of fruit and yogurt! You are loving eating solids! Milk is still very much a favourite, you have three to four bottles a day 5-6oz, I mix a bit with one of your medicines in the morning and at night. I have been putting some of steroid doses in. Mostly you sleep through the night but there have been a few times you've woken up very early, to be fair you happily lay there kicking your legs and playing with your feet. Mostly you have been waking around 7am. I can update your weight this time! You were weighed at the hospital a couple of weeks ago and were 8.16kg = 17lbs9oz which is lighter than I thought you were! You are mainly in 6-9 month clothes but also wearing some 9-12 month bits. The nicknames keep coming! Here are what came out last time and below there's more! You still love snuggly cuddles...I do too! In all honesty there's not a lot you kick up a fuss about right now, you are so chilled! That's it my darling girl, until next time!